Es gibt nur einen Puamana! Free Wifi! Günstigen Preisen! Teilweise Meerblick Eigentumswohnung / Stadthaus, im Erdgeschoss mit Dachboden, Tennis, drei Pools. 400 Meter vom Meer entfernt. Sie Schwimmen, Schnorcheln und Surfen mit dem Pazifischen Ozean haben direkt vor der Tür. Puamana ist eine tropische Oase, wo die Sonne immer scheint. Sie können den Luxus der Puamana Estate und legeres Wohnen auf höchstem Niveau zu genießen. Sichere, gated, tropischen Garten mit malerischen Ozean Fassade. Puamana ist ein klassisches Entwicklung in den 60er Jahren gebaut: flaches, schön geplant und gut gepflegt werden. Viel Freiraum mit dem ehemaligen Plantage Estate Home restauriert und noch auf dem Gelände als Clubhaus. Jeder Sonnenuntergang ist sensationell - das Clubhaus Veranda mit Blick auf das Meer, wo Sie wollen, um jeden Abend sein. Unser Platz ist ein Haus - nicht eine Eigentumswohnung oder Hotelzimmer. Es ist sehr angenehm mit einer Insel Atmosphäre, so dass Sie legeres Wohnen auf höchstem Niveau zu genießen. Sie werden genommen fühlen kümmern, und wird das Leben in der Mitte ein tropisches Paradies zu genießen. Unser Stadthaus verfügt über alle Annehmlichkeiten von zu Hause, und am besten von allen, ist es in den Inseln. Schön mit diesem lässig, locker Insel fühlen, Lanai, semi-private Garten / Hof und Grill ausgestattet, so können Sie wörtlich "Live außerhalb 'so viel wie Sie sich entscheiden. Parkmöglichkeiten sind vorhanden, mit einem Raum in der Nähe unserer Stadthaus. Öffentliche Verkehrsmittel zur Verfügung, um andere Bereiche der Insel, mit Zeitplaneinschränkungen. Lahaina, dem ehemaligen Walfangdorf, ist heute eine Hafenstadt / Hafen. Lahaina ist ein Zentrum für Aktivitäten, so dass es um eine große Attraktion für die Spaß liebende Massen weiter. Wassersport aller Art gibt es hier, und die Stadt ist voll von Restaurants Betriebe, Einkaufsmöglichkeiten in Hülle und Fülle, einem Kino usw. verpackt Lahaina zieht auch Künstler und Interessenten in ihre Arbeit. Dies ist definitiv ein Hot Spot, und das Stadtzentrum ist eine schnelle zehn Minuten zu Fuß oder fünf Minuten mit dem Fahrrad von unserem Platz. Puamana, auf der anderen Seite, ist ruhig und abseits der Massen. Das bedeutet, dass Sie das Beste aus beiden Welten. Dies ist ein sehr begehrter Lage auf Maui, und Puamana ist der Ort zu bleiben. Puamana ist eine historische Entwicklung; ein von einer Art! Denken Sie daran, es gibt nur einen Puamana! Und Sie können dabei sein. E-Mail zu reservieren oder für weitere Informationen zu unserem Platz. My family of four (two teenage boys 16 & 18) just came back from a wonderful relaxing 10 day stay at Puamana. Everyone agreed it was one of the best locations and complex we have stayed in. The pool by the oceanside is now one of my favourite spots in the world!! I loved having my first cup of tea there in the morning to watch the whales (plenty to see) and then in the evening I would have my glass of wine there to watch the sun go down. My husband and I even tried tennis, haven't played for years, as the court was so near the apartment. The grounds are beautifully maintained and the staff very helpful in the clubhouse. There is a gym which is small but ok. My boys used it every day for weights. $10 per day or $23 for 7 days per person. The bikes were great for cycling into town. Way faster and easier than walking or driving. The only very minor downside was the air conditioning noise in the master bedroom, so we had that off a night which made the room a little warm. We used the fan instead. James and Martha are extremely fast in communicating and answering any questions we had. Our apologies about the AC. But thank you for the feed back. We'll replace the unit today. Hope you'll decide to come back and stay in the future. Lovely garden location unit in Puamana. Well supplied with all kitchen items in remodeled kitchen. Comfortable living room and bedrooms and just a short walk to the clubhouse and ocean. I would come again. We had an exceptional stay and recommend to all. This townhome was equipped with everything we needed. The location was perfect for us because we could walk to an amazing surf break. The tennis courts are in great shape and steps from the townhome. The pools are beautiful and we felt safe in a gated community. We road bikes many times into Lahaina. We enjoyed yoga and restaurants in Lahaina. The owners were generous with sharing information that would be of interest and also with bikes, boogie boards, fins, rubber surf boards, beach chairs, coolers, towels, etc. They are well known by the locals. We were most happy with our stay. Home features all the amenities needed for a home like stay.Clean and well equipped with modern features. Hosts are very accomodating and hospitable.Would definitely return. Our stay at Puamana was nothing short of perfect. Upon arrival to Maui, I realized I had never gotten arrival information from VRBO. I messaged the owner, James, who immediately responded with everything we would need to access the property. The community is gated, so we felt very safe throughout our stay. It is a very quick walk to the oceanfront within the property, and while the beach is not a sandy one you can lay out at, it is beautiful to sit out and watch the sunset or just enjoy the waves. All amenities we could have needed were provided- including all beach chairs, towels, and a cooler, which made beach days super easy. We loaded up our car, and there were beautiful, nearly empty, local beaches just north of downtown Lahaina. There were also 4 bikes, which made going into Lahaina during the day super easy and fun. While 2 of them are old, and slightly difficult to ride, they all do work just fine. 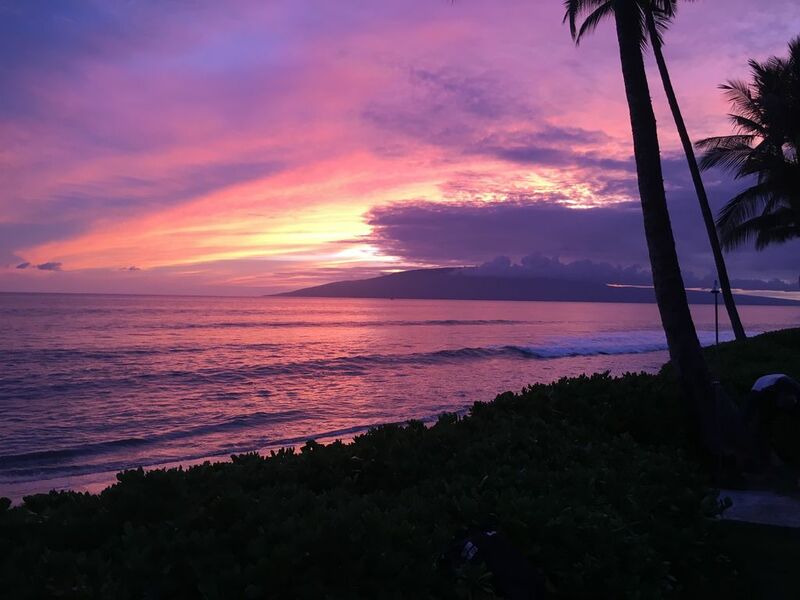 Would highly recommend this property for anyone looking to relax and enjoy Maui, without the hustle and bustle of a hotel resort, but still want the option to hop over to town easily and enjoy the restaurants and shops. Thank you for everything James!